Below is our account of the British pound's volatile week in which we saw the UK vote to leave the European Union and the UK Prime Minister Resign. The UK's decision to vote to leave the European Union has come as a massive shock to markets which had traded notably higher ahead of the release of results on the assumption the Remain vote would win. Following the result, the Prime Minister David Cameron promptly resigned ensuing a period of uncertainty now awaits the UK economy and its currency. It was an assured address by the Governor of the Bank of England, Mark Carney, which appeared to settle nerves and convince markets that the sky had not actually fallen on their heads. Final results showed 17.4M voted to leave, 16.1M to remain. Unfortunately this is an unconvincing 52/48% split which in itself poses serious social and political questions about the UK's future. A 72% voter turnout was achieved - this was the UK's biggest ever exercise in democracy. The pound fell to its lowest level in 30 years against the dollar after the electorate defied what was clearly a misguided market which only 24 hours earlier had been rising on the pbservation that bookmakers were seeing a 90% chance Remain would win the vote. The initial big hit to the pound came from Sunderland, an electoral area that was expected to deliver a win for Remain. In the event, the Brexit win was large and markets quickly got the hint that this Referendum was not the one-way bet for Remain that had been expected. "Brexit is a not a ‘Lehman moment' that will trigger an unforeseen chain of events. Policymakers and companies have had time to make contingency plans, even if they can't fully offset the impact. "A period of uncertainly starts with the need to choose a new leader of the Conservative Party, then goes on to a drawn-out process of untangling the UK from the EU. Uncertainty is bad for UK growth and won't help Europe either. That wouldn't matter if the global economy were ticking along nicely but it isn't. "We expect the pound to fall another 10% over time, and the euro may fall by about half that much." Credit Suisse meanwhile reckon the dollar rally is likely to continue, with GBP/USD moving into the 12.0s, while dollar Yen could settle below 100. The only note of caution is the possibility of central bank intervention – possibly in a coordinated fashion. "While this vote does not represent a systemic shock to the financial system on a par with Lehman or a Greek departure from the euro, it does represent a powerful turning point. The UK has taken a significant step back from globalisation. That’s a trend gaining political support across the west. Such a significant secular shift has the potential to have substantial implications for growth, corporate profits and asset prices in the medium term." UBS have briefed clients with their view on the outlook for sterling noting that there is a floor. "We expect to see significant volatility in currencies and equities until a greater understanding of the consequences of the UK's decision is gained. In our view, it is reasonable to expect that sterling will settle in the mid 1.30s level against the US dollar until some clarity emerges. Beyond this level, we would note that sterling would be significantly undervalued and markets would probably be reluctant to sell," says Dean Turner at UBS. It appears Carney's appearance has aided a recovery in sterling. At 1.2482 the GBP/EUR is actually not too far below the mid-June lows. We are still some way above the February lows in the late 1.23s. Carney has made a very assured and direct address to the markets. He says we should expect volatility, but the Bank of England is well prepared for Brexit having put in place "extensive planning." The Bank will "not hesitate to take additional measures" and has 250BN pound of additional funds is available to markets. UK financial system is strong, capital requirements of banks x10 higher than at time of financial crisis. Foreign currency liquidity to expanded. In the coming week the Bank will assess economic conditions. "Markets already reacted strongly today, but not panicky. They could recover again in the medium term, as in our view an amicable divorce with a continued British membership in the single market is the more likely scenario. We also show that the negative impact on the UK real economy will be smaller than in past crises." What now for the pound and financial markets? John Cairns, at RMB Global Markets points out that the UK now needs to negotiate its exit. This might well take the rest of the decade or more and nothing legally changes in the interim. "The best case scenario then is that everyone keeps calm and carries on, and markets quickly stabilise and recover most of their lost ground. says his initial bias is that the keep calm scenario will ultimately prevail. "Expect the next week or two to see extreme volatility, negative headlines from the UK and political rumblings in Europe. But nothing will change and the markets will eventually calm down." Meanwhile, word from one of the UK's largest foreign exchange dealers, UKForex, reports a 400% increase in customers making currency transfers, "as Australian consumers have flocked to buy sterling at an exceptionally cheap rate." Where Next for the Pound v Euro? NAB's Parsons forecast GBP/EUR above 1.44 within days of Brexit. The battle of the analysts begin. "We need strong and calm leadership from the Government, working with the Bank of England, to shore up confidence and stability in the economy. “The choices we make over the coming months will affect generations to come. This is not a time for rushed decisions." Crititical communication to come from Governorn Carney this morning in response to this massive fall in the pound. He will only speak following Cameron addresses the nation though. "Markets should awake in the northern hemisphere to a coordinated G7/G20 joint statement that authorities are prepared to provide liquidity as needed and to act against excessive volatility in global markets. The centrepiece of their plans is the six-way currency swap arrangements between the Fed, the ECB, the BoE, the BoC, the BoJ and the SNB. The BoJ and the SNB may be inclined to act unilaterally to counter excessive strength in CHF and JPY." - Damien McColough at Westpac. 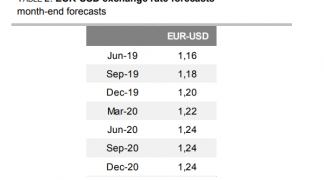 Euro Outlook Deteriorates Massively, Parity Ahead for EUR/USD? The EUR-USD is under pressure due to the risk-aversion and at exchange rates of below 1.10 the technical side has deteriorated massively. "The exchange rate has fallen below the December uptrend, as has the 200-day line at 1.1100. On the indicator side the sell signals dominate. A test of the important support around 1.05/08 cannot be ruled out in the medium term," says Ralf Umlauf at Helaba. We have noted that many analysts have forecast the euro to hit parity against the dollar on a Brexit. At 5AM it became clear Brexit has happened. The betting markets have completely flipped. Sterling rallied to its best levels of 2016 on Thursday morning when the chance of Remain winning was set at 90%. At 2:20 on Friday morning odds are at about 50/50. Sterling has collapsed in sympathy. Chaos on global markets at the time of writing - the pound is obviously bearing the brunt of the hit but FTSE 100 futures suggest the market will open a whopping 5% in the red. Billions will be wiped off the market. Let's Look at Those Brexit Forecasts Again Shall We? USD/JPY potentially breaking 100 temporarily. Remain should still win the day say TD Securities. We now have the first 10 voting areas reporting, and so far the results show support for Remain at 46.3%, and Leave at 53.7%. "But with just over 1% of votes reported, there remains a long way to go. Turnout has so far averaged 73%, which again is supportive of the Remain camp. 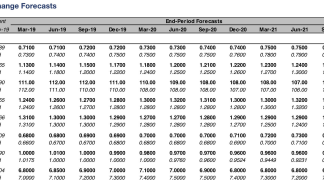 Broadly speaking, most of the results have been in line with our forecast models (see below), which continue to point towards a final 52% Remain vote for the night," says James Rossiter at TD Securities. Shock results in from Sunderland where Remain was supposed to win. Leave takes 61% of the vote. “To put tonight’s volatility in perspective, sterling’s plunge on that Sunderland count was bigger than Black Wednesday’s 4.1% drop. Markets are incredibly nervous now and it’s definitely tin hats time. If Leave wins there will be carnage for cable.” - Joe Rundle at ETX Capital. Newcastle-Upon-Tyne has delivered a very close victory to Remain, it was expected to be stronger by pollsters. Remain: 50.7%, Leave: 49.3%. With rumours of Leave doing well elsewhere, nerves are high and volatility is likely to extend. The GBP has pulled back from recent highs on the news. Is the Remain win as assured as previously thought? The YouGov Call Back Poll - 52% Remain, 48% Leave. This is not an exit poll, rather it sees pollsters call those people surveyed over previous weeks to establish their final decision. It was spot-on with the outcome of the Scottish referendum, but missed the market in the General Election in 2015. "Tonight’s YouGov polling suggests 52% for Remain and 48% for Leave – enough to keep markets relatively calm for but we’re not counting out some big volatility. FTSE grey market and sterling have risen immediately on the news – cable has even hit $1.50 – the highest since December." - Joe Rundle, Head of Trading at ETX Capital. 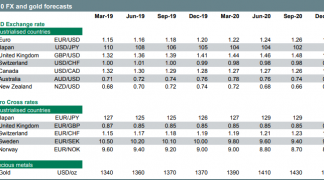 "Our estimates suggest that Brexit risk premium has been completely priced out of GBP/USD (compared to 5% worth of risk premium priced in in the middle of the last week), while the safe haven JPY has partially handed back recent safe haven gains." - Chris Turner at ING. In short, this means there is unlikely to be much more upside left in sterling's tank after the gains seen through the day. 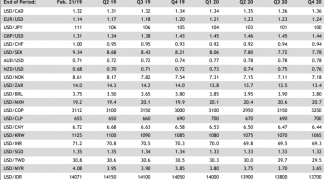 An interesting table from the team at Nordea Bank, who we have been following with interest today. The table shows their official forecasts, based on Remain winning. The GBP has certainly lost a lot of its shine heading through mid-afternoon. Traders may have realised how rediculously agressive the move higher in sterling was getting and have decided to exit in case they have got it spectacularly wrong. And, as we note below, the pound has pretty much recovered all its Brexit premium - i.e the gap between where it should be and where it was based on Brexit fears. There have been anecdotal reports of queues forming outside many of London's FX bureaus this week. Travel money providers No.1 Currency has reported a 70% surge in business compared to this time last year as holidaymakers clamour to buy their foreign currency in the final hours before the result in Britain’s EU referendum. No.1 Currency recorded its busiest day of the year on Wednesday with customers queuing outside its network of 102 high street stores. The surge in demand for foreign currency also saw it record its busiest ever day for online sales, and a 300% increase in orders for home delivery of currency. I have a feeling No.1 Currency will find the rest of the summer quiet now that a good portion of the market has been dealt with. "With polls showing a clearly divided populace the situation remains fluid and markets could turn on a dime if news begins to leak out that Leave vote is close. "As of now GBP/USD has become a highly asymmetrical bet with most of the upside already factored into the trade. Therefore if Remain does win the cable rally is likely to peter out at the 1.5000 level. However if Leave begins to pull ahead the pair could slide as much as 1000 points in a matter of minutes." "With bookmaker odds moving in favour of Bremain (over 80% now), the markets are cheering, and we side with them. The GBPUSD just hit new highs of the year, 1.4886. This is an important level, breaking the downtrend since 2014, suggesting further upside risks. The USD is weaker broadly, thus the EURGBP doesn’t move much. "At this point, it is difficult to see the GBPUSD down to below 1.40 even in the worst case scenario tomorrow. The market has room to reprice BoE on Bremain – bring forward the first rate hike from more than 30 months from now to sometime early next year, which should push the GBPUSD to 1.50 and above in the short term. Our 3M forecast in remains 1.47 for GBPUSD, but it is subject to upward adjustments in case of Bremain." The final poll is out, this one from Ipsos MORI. It shows Remain ahead on 52 to Leave's 48. This is most likely the cause of the recent surge in GBP/USD and GBP/JPY. There will be some private exit polls released as polls close at 10PM tonight. The only problem is they were conducted by hedge funds. So look for heavy directional bets on the market to indicate which way they see the results as having gone. A plummet in the pound tells us Brexit has won. While the hedge funds reap the benefits of their sneaky little jump to the front of the queue, the rest of us will have to watch the outcome of key battleground areas for a clue as to where the results are going. Two 'high undecided' areas are South Tyneside, with a lean to Leave, and Sunderland with a Lean to Remain. Our full cheat sheet is here. ING's Petr Krpata says under "one set of working assumptions," he sees GBP/USD trading to 1.52 in the case of a Remain vote. (3) re-pricing of the BoE monetary policy outlook. Brexit, uncertainty, small businesses and a sterling shock. Has the Pound Already Hit its Best Against the Euro? How much higher can the GBP/EUR extend on a final Remain outcome? “At this stage, it appears that much—if not most—of the referendum risk premium may have been squeezed out of GBP,” says Ned Rumpeltin, an analyst with TD Securities. Rumpeltin thinks sterling’s sharp rise over the last several days has largely sapped its ability to rally substantially on a Remain win. “Sterling can - and likely will - still pop higher on a vote to stay an EU member, but our ambition is considerably more limited than it had been,” says Rumpeltin. We suspect the initial target for a GBP/EUR rally would be the 1.32 highs recorded in late May - a time when markets really were writing off the chance of a Brexit. Could that be the fair value sterling will strive for once the Brexit premium has been dismissed?